Last weekend I did Bay to Breakers run in San Francisco. I’m not a runner. I did cross country in junior high, and with the wrestling and track & field teams in high school we did 5-mile runs for conditioning. Still, Bay To Breakers is a 12k run, 7.45645 miles! (Yes, I Googled it.) I have never run this far in my life. 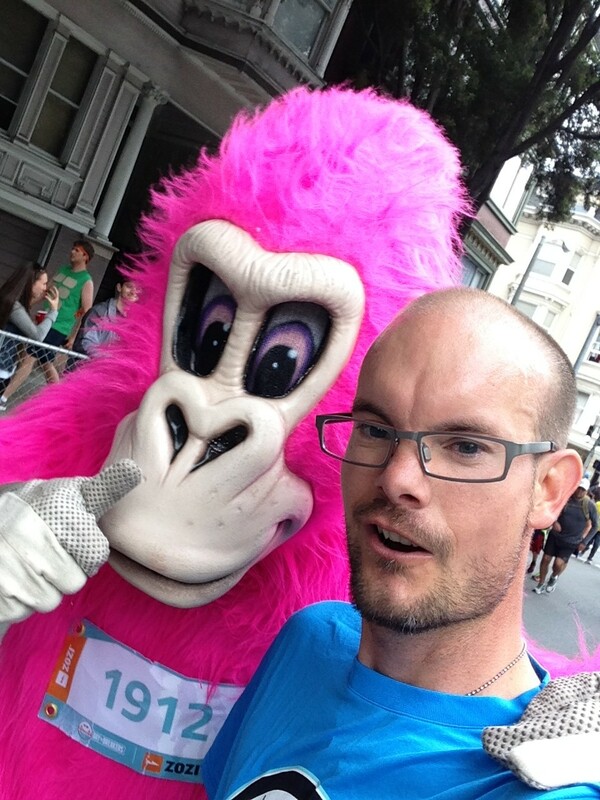 Selfie at Bay to Breakers 2014 with the mascot, Ape Hashbury. I’m still feeling like a champ, and I learned some things too. Jon and I have a mutual friend, Nick who is in the San Francisco band Nova Albion. Nick invited Jon and I to be roadies for their gig at the San Francisco Giants Brewfest, in exchange for fun times and free tickets to the game. The show was great, the beer was good, but the Giants got shutout by the Marlins 5-0. That’s alright we love our home team no matter what. Nick intended to run Bay to Breakers with us, but he had hurt a rib diving for a catch in a game of Ultimate Frisbee. So he drove Jon and I down to the starting line. Jon runs regularly and has done several organized runs. I had so many questions for him. Should we jog to the start to warm up? Do you double-knot your shoelaces? Should I bring my wallet, or just my debit card and five dollars? I’m always pretty inquisitive, but when I’m faced with something new, my brain works overtime, and Jon put up with me graciously. All the questions are kinda useless. There’s a start line, there’s a finish line, go from one to the other. I didn’t wear special running gear, other than shorts, the official race t-shirt, and some old running shoes from the back of the closet. I didn’t prepare besides a good night’s sleep, a light breakfast, and some water before we left the house. Bay to Breakers is known for it’s fun, celebratory atmosphere. Although serious runners come from around the world, many people dress in wild attire or full costumes. Jon guessed that probably half of the 80,000 participants (many participants do not register) walk the entire thing. If they can finish so can I! I expected to walk parts of the course from getting tired, but I didn’t expect to have to walk from my legs hurting so badly. A major motivating factor for doing the event at all, was Dustin & Angie’s crazy commitment to Relay For Life. Relay For Life is a 24-hour walk or run around a track as a cancer fundraiser. Participants do it in teams, so nobody has to walk the whole time. However, about a month before the vent, Dustin & Angie decided that one of them would be on the track at all times. Their team was welcome to walk or run with them, or we could just sit and tend to their informative booth while they continued on. I arrived at 10 a.m. and spirits were high. I jogged a lap for good measure, but mostly I just stayed at the booth to continue fundraising and cheer on Dustin and Angie. I returned again at around 10 p.m. and they had already gone 30 miles—more than a marathon—EACH! Angie had fallen behind Dustin’s distance because she had been managing the silent auction during the day. So approaching midnight, she was running around the track to catch up to Dustin. They continued around the track through the night. The next morning I saw their posts on Facebook. Near the end, the loudspeaker announced that the event had raised 62 thousand dollars. The crazy couple, Dustin & Angie, were elated to hear this announcement as they approached the finished line of 62 miles—EACH! Sure, they regularly do marathons and Ironman races and crazy things like that, but I figured if they can do 62 miles in 24 hours, I could do 7.5 miles through San Francisco. The first few miles are pretty slow. The crowd is so thick there’s a fair amount of walking. Around the 5-mile mark it thins out, I found my groove and kept a steady pace. The interesting costumes all around and other entertainment from the sidelines definitely helped keep my mind off the arduous task and made it easier. Nonetheless, around 6 miles I had to stop and stretch my legs. I wasn’t so much tired or out of breath, I just had pain in my groin. I bicycle a fair amount. So I expected to be sore for a few days after the run, but I didn’t expect my legs to hurt during the run. Two or 3 times before the finish, I had to step to the side of the other runners and stretch out my inner thigh. A friend later told me it was my adductor muscles. It hurt bad. I mean, I didn’t feel like crying, but I did consciously try to remove the grimace and smile so the other participants wouldn’t think I was a wuss. I tried to refrain from waddling, and walk normal so they wouldn’t think I needed proper medical attention. Ok maybe I’m slightly exaggerating. It felt better after stretching and I continued on, enjoying the scenery of Golden Gate Park, and all the fun surroundings. I walked more in mile 7, but I picked it up and jogged to the finish line, got my finisher’s medal, and took a picture with Jon, who finished about 40 minutes earlier. “Do you feel like a champion?” I asked Jon. Jon generally pushes his body harder than I do mine. Perhaps he was thinking of his time compared to the winner, who finished in 35 minutes! “Don’t you feel like a champ?” I nodded with a smile as I held up my finisher’s medal. Everyone gets one. But I still felt pretty awesome. We hydrated, ate a bagel and banana, and checked out some of the scene at the finish line. Then we used our phones to map our way to Nick’s house, 3 miles away. “Let’s walk and make it an even 10 miles!” Jon exclaimed. I looked at a street sign: 46th Ave. We had to go to 6th Avenue! I tried not to think about it, and I warned Jon that I might have to stop to stretch a couple times along the way. Every few blocks, I told Jon and we stopped. He waited as I sat on the sidewalk with the soles of my shoes together and did the “butterfly” stretch. The first few times, it seemed to help and I could walk several more blocks before having to stretch again. Then it didn’t seem to help much. “It’s going to take forever at this pace,” said Jon, who had hydrated much more than I while waiting for me at the finish line. The sun was bright and I was in pain. Brainstorming other remedies, I started looking around for a corner store to buy hydration, and hopefully ibuprofen. There was a boy selling lemonade at the corner. I drank one there and took 2 to go. That was a long walk. And we made it back home to Nick’s. I stretched a little more, had some water, ibuprofen and rest on the couch. Sure, I knew it was “possible” to finish. I mean, even if I walked the whole way, I could at least finish. However, not even being a “runner,” and not “training” at all, it really did seem somewhat “impossible.” And I still did it. It hurt way more than I expected it to. The difficulties came in a form different from what had expected. And it was more intense than I expected. And I still did it. The walk home was so long. In the moment, those 40 blocks that we walked to Nick’s house seemed to take forever. And they then we arrived. A week later, my legs haven’t fully recovered. But I’ve already gone on a couple of fairly intense bike rides that felt pretty good. Bay to Breakers was a significant challenge to me. And then it was over. I lived through it. There will be more challenges. Like making a livable wage after leaving my stressful job a year ago; finding creative, meaningful purpose in life; or just figuring out why the interior light bulb in my car doesn’t come on anymore. And I will get through all of them, like a champ! The title of this post says 3 things I learned from this experience, but I’m going to give you one more: Take time out to enjoy life with people you care about. 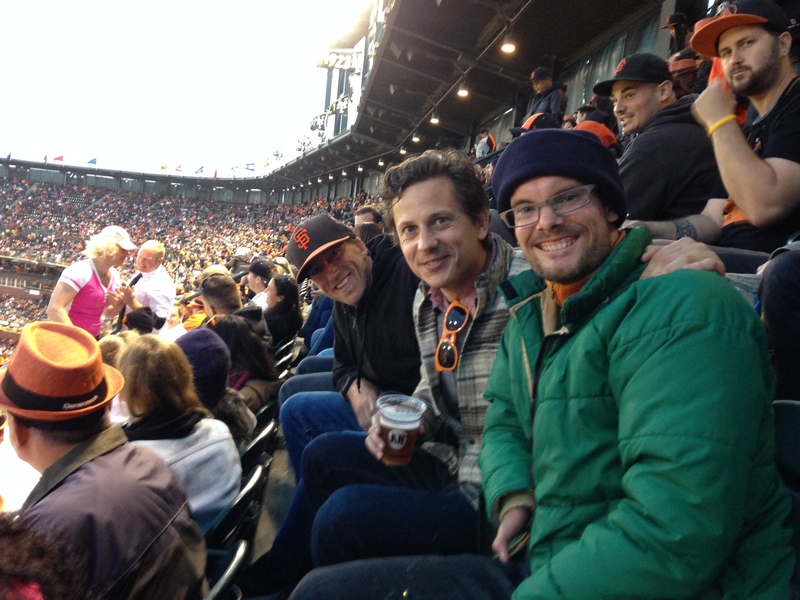 Jon, Nick, and I at San Francisco Giants game May 17, 2014. Maybe you’re a workaholic. Maybe your loved ones are really far away. Maybe you’re like me and you spend too much time thinking about tasks, and not enough time thinking about people. For years, I’ve been very active in school or work, personal activities, volunteering with community groups, travelling, and anything else. I rarely take much time to put things aside and just relax, think of nothing, enjoy the sights and sounds, or visit with people who are important to me. Perhaps I take these things for granted. Perhaps I’m running from something. It’s not just me, who knows why Americans have become so busy in their lives! Yet relationships are important. The human brain actually needs relationships. (I read a book about it.) Besides, it’s just about being a good person. I need to take more time for relationships. It’s something I’m working on. It’s a work in progress. Probably we all need to do it. Nick and Jon are 2 of my best friends. (I have other best friends, too.) From the band playing at AT&T Park, to the Giants game, Bay to Breakers, and fun barbecue afterward, it was a great weekend. I’m glad I took time out for it. Not to mention a pretty awesome first date with a lady who came to hang out with us after the run. Perhaps more on that in a future post. In the next entry, I’ll write more about San Francisco Giants Brewfest and what I learned about the future of lagers.